eSigns provides online printing services for different types of signages and banners. It has a web-based designer tool which features more than 130,000 template designs that customers can use and customize. In this article, we cover eSigns reviews and pricing. Ready to get started? Get a quote. 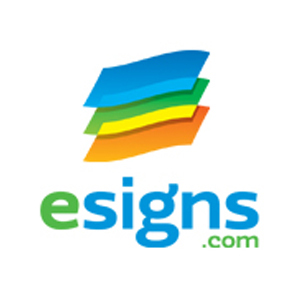 Users who gave eSigns a positive review appreciated its online design tool, decent pricing, and quality of products. They also cited its smooth ordering process and excellent customer service. One user who gave eSigns a positive review on Sitejabber said that the platform gives him a lot of flexibility for customization. He also shared that the quality of the products they’ve ordered from eSigns has been outstanding. Users who gave eSigns a negative review complained that creating an account is difficult and that the platform has glitches sometimes. Some also said that navigating some parts of its website is complicated. One user who gave eSigns a negative review on ShopperApproved said that its new site design is cumbersome because its drop-down menu kept covering his artboard. He added that a 15-minute design took two hours because he could not save his work due to a technical problem. eSigns pricing depends on the quantity, type, material, size, and design the customer will choose. Their pricing rates range from $7.99 to $2,295+ per item. Customers may visit the products page on its website to determine the pricing for each item. The company also offers discounts and free shipping. Ready to get started with eSigns? Get a quote. What payment options are available for eSigns customers? 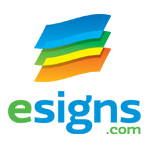 eSigns accept payments from major credit cards like Visa, MasterCard, and AmEx. Customers can also pay using checks by mail and PayPal. What shipping services does eSigns use to ship orders? For standard orders, eSigns ships their items using FedEx Ground. However, customers may opt to upgrade the shipping service to Air or Expedited Shipping Service at an additional cost. Read our reviews of all top marketing software providers or check out one of these three top marketing software options.